A modem is a hardware networking device that converts data to a signal so it can be easily sent and received over a phone line, cable, or satellite connection. In the case of transmission over an analog telephone line, which was once the most popular way to access the internet, the modem converts data between analog and digital formats in real time for two-way network communication. In the case of the high-speed digital modems popular today, the signal is much simpler and doesn't require the analog-to-digital conversion. The first devices called modems converted digital data for transmission over analog telephone lines. The speed of these modems was measured in baud (a unit of measurement named after Emile Baudot), although as computer technology developed, these measures were converted into bits per second. The first commercial modems supported a speed of 110 bps and were used by the U.S. Department of Defense, news services, and some large businesses. Modems gradually became familiar to consumers in the late 1970s through the 1980s as public message boards and news services like CompuServe were built on early internet infrastructure. Then, with the explosion of the World Wide Web in the mid and late 1990s, dial-up modems emerged as the primary form of internet access in many households around the world. 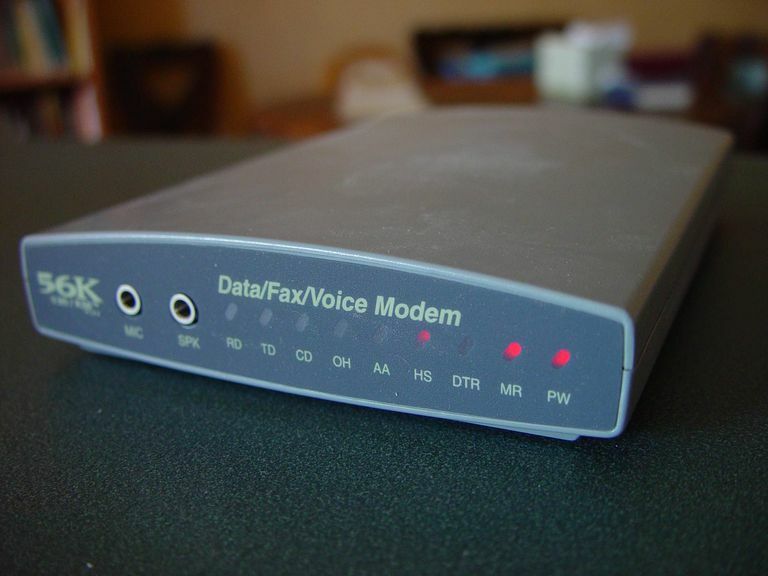 Modems used on dial-up networks convert data between the analog form used on telephone lines and the digital form used on computers. An external dial-up modem plugs into a computer at one end and a telephone line on the other end. In the past, some computer makers integrated internal dial-up modems into the computer. Modern dial-up network modems transmit data at a maximum rate of 56,000 bits per second. However, the inherent limitations of public telephone networks often limit modem data rates to 33.6 Kbps or lower. When you connect to a network through a dial-up modem, the modem relays through a speaker the distinctive handshaking sounds between your device and the remote modem. Because the connection process and data patterns are similar each time, hearing the sound pattern helps you verify whether the connection process is working. A broadband modem like those used for DSL or cable internet access uses advanced signaling techniques to achieve dramatically higher network speeds than earlier-generation dial-up modems. Broadband modems are often referred to as high-speed modems. Cellular modems are a type of digital modem that establishes internet connectivity between a mobile device and a cell phone network. The word modem is a mashup of the term modulation/demodulation, which is the technical term for the conversion between digital and analog signals. External broadband modems plug into a home broadband router or other home gateway device on one end and the external internet interface such as a cable line on the other. The router or gateway directs the signal to all the devices in the business or home as needed. Some broadband routers include an integrated modem as a single hardware unit. Many broadband internet providers supply suitable modem hardware to their customers at no charge or for a monthly fee. However, standard modems can be purchased through retail outlets.